Chris joins SAHC as our new Stewardship Associate. His primary responsibility will be stewardship of properties that have a working agricultural component. 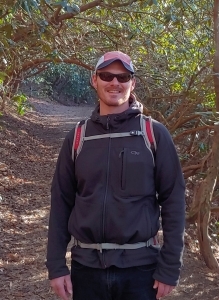 Chris moves to Asheville from Columbia, SC, where he worked as the stewardship coordinator for the Congaree Land Trust while finishing graduate school in the Department of Geography at the University of South Carolina. 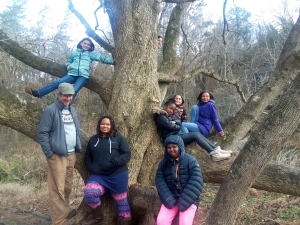 In November, AmeriCorps member Whisper Moore led an afterschool group from Stephens-Lee Recreation Center to experience birding at the Beaver Lake Bird Sanctuary in North Asheville. In a previous afterschool session, Whisper had introduced students to migratory birds with the #GreatMigrationChallenge game. For this field trip, Bethany Sheffer and Simon Thompson of the Elisha Mitchell Audubon Society chapter joined us to share their expertise. Do you know the story of Rocky Fork, TN? SAHC is proud to have been a leader in protecting the 10,000-acre Rocky Fork watershed. This stunning scenic watershed is a unique, fragile ecosystem with rare and endangered species. 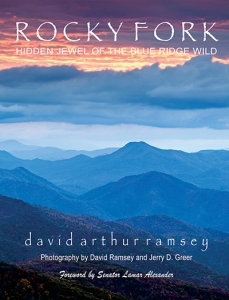 Former SAHC Trustee and nature photographer David Ramsey elaborates in his new book Rocky Fork: Hidden Jewel of the Blue Ridge Wild. David will donate 20% of each copy pre-ordered through his website using promo code SAHCRF by Nov. 30. Be sure to use code “SAHCRF” for SAHC to get a donation from your book purchase. **This code also gets you 10% off the cover price** Please disregard any other promo codes on the website. I’m David Ramsey, former SAHC Trustee and long-time fellow supporter. First and foremost, I want to extend my heartfelt gratitude to you for supporting SAHC. It is through your engagement and help that it has become one of the most effective and important mountain land protection organizations in America. Since its organization in the early 1970s, SAHC has achieved some incredible conservation wins for the southern Appalachian Mountain region. One of the greatest of these victories was saving the 10,000-acre Rocky Fork Watershed from imminent destruction. As a native resident of Unicoi County, TN, where Rocky Fork is located, I was very fortunate and proud to be part of that effort. In fact, when I first learned about the scope and seriousness of the threat to Rocky Fork in late 2005, I sounded an alarm to regional and national conservationists, the news media and the people of the region — and I’m proud to say the first call I made was to Carl Silverstein, SAHC Executive Director. 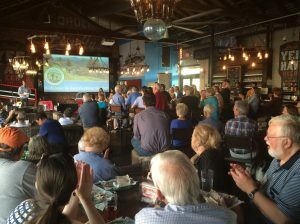 What happened next, in my view, is one of the great stories of the last half-century about the coming together of diverse people and groups to fight for the protection of a true Appalachian and American treasure. 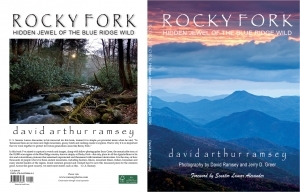 I hope you will choose to read my first-hand account of that story in my new book, Rocky Fork: Hidden Jewel of the Blue Ridge Wild. The Holiday 2018 release of the book honors SAHC’s key role in saving Rocky Fork through the donation of 20% of sales made to visitors to my website who use the code: SAHCRF. Please visit www.ramseyphotos.com to learn more about the book and/or to make a purchase. The deadline for taking advantage of this opportunity to further support SAHC’s vital work is November 30, 2018.
https://appalachian.org/wp-content/uploads/2018/10/2018NewTrustees-e1540307597739.jpg 1116 2042 sahcadmin /wp-content/uploads/2016/03/southern-appalachian-highlands-conservancy.png sahcadmin2018-09-06 15:11:562018-10-23 15:24:00Welcome, New Trustees! Conservation Trust for North Carolina’s Diversity in Conservation Internship Program introduces students from diverse backgrounds to careers in conservation by providing paid internships at land trusts and partner organizations. CTNC has funded 92 interns at 18 land trusts and 13 partner organizations since 2008. Tamia is a rising junior at UNC Asheville, majoring in Environmental Studies with a concentration in Management and Policy. 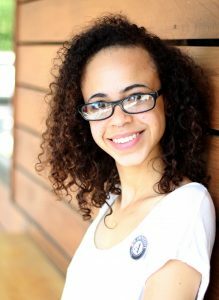 This summer she is serving as our Communication, Education, and Outreach Intern. Tamia has spent time with volunteer and hiking groups at our Community Farm and in the Highlands of Roan, writing articles and taking photos for our blog and newsletter. She also interviewed members of the community to research and write a personal narrative article about African-American relationships with land and agriculture. 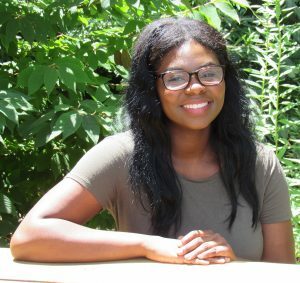 Through her internship, Tamia hopes to gain practical experience in the field of agriculture, build professional relationships, and acquire skills that will lead to a career in conservation. Her personal hobbies and interests include hiking, cooking, meeting new people, and dog sitting for friends. She is originally from Lenoir, NC, and moved to Asheville because of her love of the WNC mountains. Kimani was born and raised in Brooklyn, NY. He is a rising junior and student athlete at the UNC Asheville, majoring in both political science and sociology. When not participating in track and field, Kimani can be found in many departments around UNCA. He is a peer mentor and member of the Order of Pisgah, the Political Science Club, and German club. 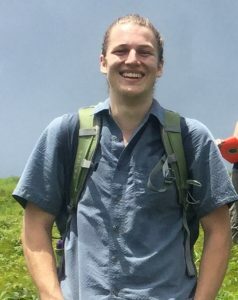 This summer he has been working as the Communications Intern for Blue Ridge Forever, the coalition of land trusts in WNC. To assist in communications, Kimani used tabulated GIS data to create impactful statements and a story map outlining the collective conservation impact of Blue Ridge Forever partners (including SAHC). The Duke University Stanback Internship Program is generously funded by Duke alumni Fred and Alice Stanback. The Stanback Internship Program provides Duke students with significant project-based learning experiences in energy, conservation, advocacy, policy, research, and applied resource management. The Stanback Internship Program is open to any Duke student – undergraduate, graduate, and international students. 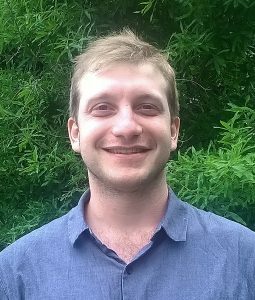 Tal Jacobs is a graduate student at Duke University’s Nicholas School of the Environment. 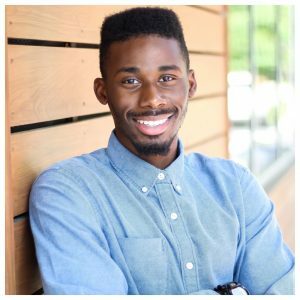 He is pursuing the Master of Environmental Management degree and is most interested in conservation planning and landscape analysis. Tal grew up in Concord, NC and likes to think of Western NC as a second home. Working as our Land Conservation Priority and Planning Stanback Intern, Tal has been assisting our Land Protection staff in the development of GIS-based parcel prioritization processes and model reports. He is excited to participate in the protection of the places that sparked his passion for the natural world. 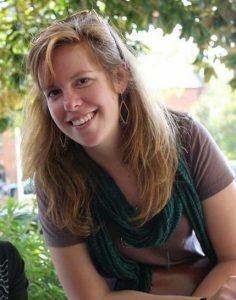 Sarah is currently working on her Master’s degree in Environmental Management at Duke University’s Nicholas School of the Environment. Sarah hails from Virginia and did her undergraduate degree at the College of William and Mary. As a Stanback Intern, Sarah has been assisting in Roan Stewardship by collecting historic grassy balds management data for the Roan Highlands and creating an online story map to portray the years of work performed by SAHC, our partners, and local volunteers. 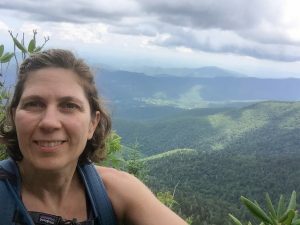 Sarah enjoys hiking, camping, and spending time on the river, and is very pleased to be spending her summer in one of the most beautiful parts of the Appalachians. 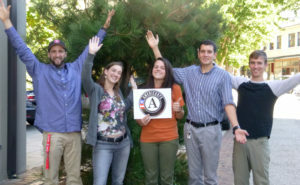 The City of Asheville Youth Leadership Academy (CAYLA) recruits, trains and places local high school students at meaningful summer jobs with the City of Asheville and with participating agencies, in addition to providing weekly day-long workshops on financial literacy, leadership, career exploration and 21st Century job skills. 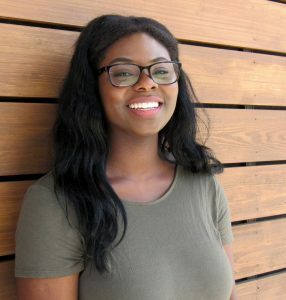 Fisayo is currently a final year student at Buncombe County Early College. Originally from Lagos, Nigeria, she moved to the United States with her family in 2005. She has been in WNC for twelve years and has yet to find a dull moment or a view that she didn’t enjoy. She is particularly interested in community involvement and planning for a career in local and state government, eventually working up to become a Congressional member. Fisayo is assisting with communications, especially photography and videography at our Community Farm. In working with SAHC this summer, she hopes to gain a better understanding of how conservation works and explore the world of agriculture. Her personal hobbies include, long-boarding, biking, watching movies, and pet store hopping. A forestry intern from Sewanee University, Thomas is mapping ash stands on SAHC preserves in order to prepare for planning and treatment to protect trees from invasive Emerald Ash Borer. Originally from Kernersville, NC, Thomas is a rising junior at Sewanee: The University of the South, majoring in forestry and minoring in philosophy. His hobbies and interests including whitewater paddling; playing guitar, mandolin, piano; and he is learning to play the carillon at Sewanee. His favorite thing to do is go on hikes and enjoy the nature and animals. This summer, Thomas has been creating an inventory of white ash tree populations in SAHC’s preserves in the Highlands of Roan. Leigh comes to us from the Patagonia store in Atlanta, Georgia. Patagonia offers employees the ability to protect the environment through the Environmental Internship Program. She was awarded up to 7 weeks away from her regular role as Store Manager to work for the environmental group of her choice — and she chose SAHC. She is originally from Asheville, so the mountains are close to her heart. When she isn’t working, she loves to spend time with her family gardening, biking, going on adventure walks, and being outside as much as possible. She is helping this summer with hikes, event planning, merchandise inventory/organization, land protection and stewardship documents, and LWCF legislative policy outreach. 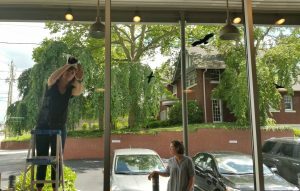 Thanks to the efforts of Sarah Sanford, a Duke University Stanback Intern with SAHC this summer, our new office has been outfitted with window decals to help protect our winged friends. https://appalachian.org/wp-content/uploads/2016/03/2016AmeriCorps.jpg 1266 2048 sahcadmin /wp-content/uploads/2016/03/southern-appalachian-highlands-conservancy.png sahcadmin2017-02-24 16:58:312017-02-24 16:58:31AmeriCorps Needs Our Help!